Sportline is a Yonkers, New York, company that produces devices to manage exercise effectiveness and distance. The company website notes that it is the global leader in fitness monitoring instruments. Pedometers track your activity as you walk. Exact features vary, but many will record the number of steps, distance, calories, speed and time. As of 2010, Sportline has 17 different pedometers available. 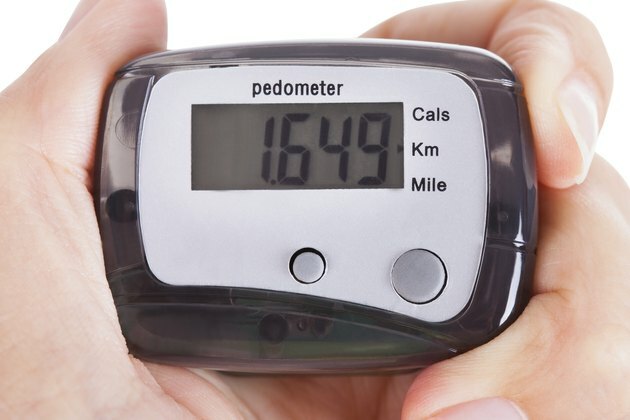 Pedometers require a set-up process in order to measure your stride length and to properly record calories and time. Check the user's manual for your model for specific set-up instructions. Take 10 normal steps across a solid surface, such as a sidewalk. Mark the start and end point based on these steps with chalk. Use a measuring tape to determine the length from the starting point to the end of the marked area. This is the distance you walk in 10 average steps. Divide the total length of the marked area by 10. This number is your stride calculation. For example, if you walk 100 inches in 10 steps, your stride is 10 inches. Press the "Mode" button on the face of the pedometer. For a Sportline 360, this is the bottom button on the left side. The location of the mode button will vary by model. Press the button until the display reads "Step" mode. Hold down the "Mode" button for two seconds while in "Step" mode. This will change the set-up to the "Walk" stride setting. The display will flash to indicate the proper setting is available. Use the "Up" and "Down" arrow keys on the front of the display to change the number on the display to your stride calculation. For example, if your stride is 10 inches, press the keys until "10" shows on the display. The device will set automatically once you stop entering numbers. Press the "Mode" button on the front of the display. Continue pressing until "Calorie" mode shows on the display. Hold the "Mode" button down for two seconds to enter "Weight" mode. Hit the "Up" and "Down" arrow keys to enter your weight. Set your proper weight and stop pressing the buttons. This will indicate to the unit you are done. The display will flash after accepting the weight. Press the "Mode" button on the display until you see "Time" on the screen. Hold the button down for two seconds to enter the "Time" set-up mode. Press the "Up" arrow key for two seconds if you wish to set the time in a 12-hour format. To enter time in the 24-hour format, hold down the "Down" arrow key. This would, for example, make 2:00 p.m. read as 14:00 hours. Hit the "Mode" button again and hold it for two seconds once you select the time format. This will enter the device into the set-up mode. Use the "Up" and "Down" arrow keys to input the correct time based on the time format you selected. You can reset the pedometer by holding down the “Up” arrow key for two seconds. Follow the instructions in “Stride" mode to enter stride distance for jogging. Press the “Mode” key to change the set-up from walk stride to run stride. The process is the same, except you need to run 10 steps, as opposed to walking them, to measure your running stride. These steps are for the Sportline 360 pedometer. Other Sportline models will have different features. Refer to the user’s guide of your model for proper set-up instructions.